Welcome back, dolls! I am super excited to share these next fabulous pics with you and can hardly wait for you to take in all of the fantastic floral and decor details by House of Dipali! 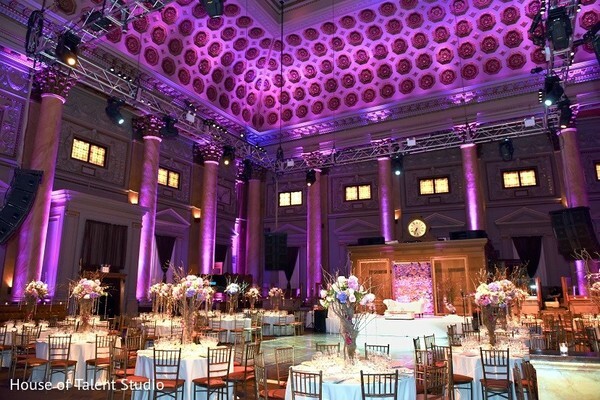 The Capitale in New York City is hosting this sensational soirée, which has been beautifully planned and designed by the expert team at Touch of Elegance Event Planners! These industry leaders are totally in-the-know when it comes to what's hot and what's not, so you can bet your pretty little payals that they've put together one visually stunning affair for today's Indian bride and groom! 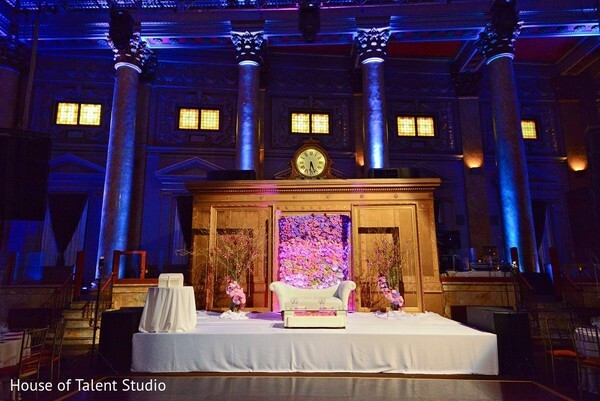 Just check out these incredible shots of the event space, all decked out, taken by the phenomenal photographers at House of Talent Studio. 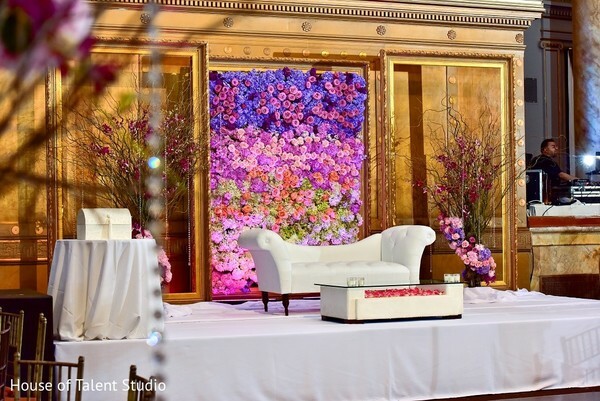 The luxurious sweetheart stage will make you swoon with its floral wall and elegant furnishings. 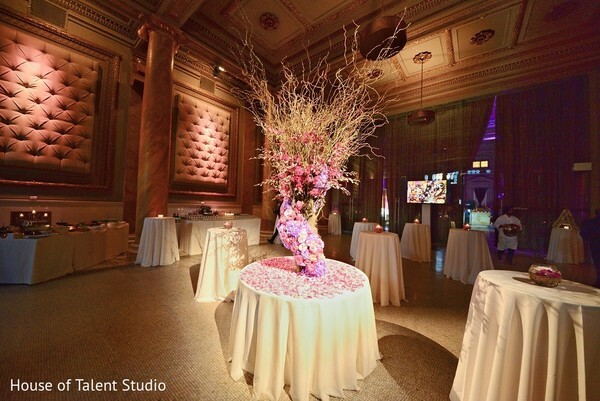 The centerpieces are another site to behold, and each design we saw seriously blew our minds. 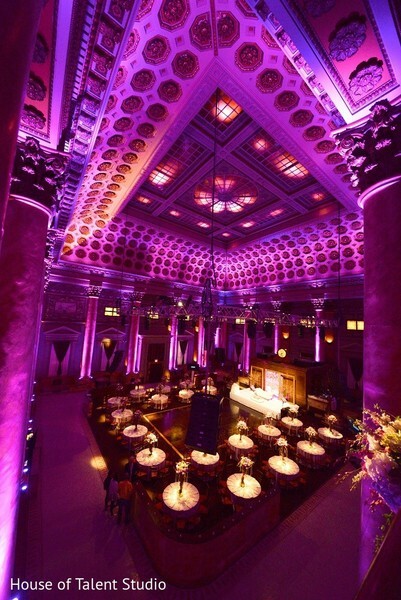 With additional elements like classic Chiavari chairs and the perfect mood lighting, this venue's already exquisite interior has been transformed into one of the most lavish party spaces we've ever seen! For even more inspiration and decor details, make your way into the complete gallery. "I wanted to keep it very simple, elegant and classy. 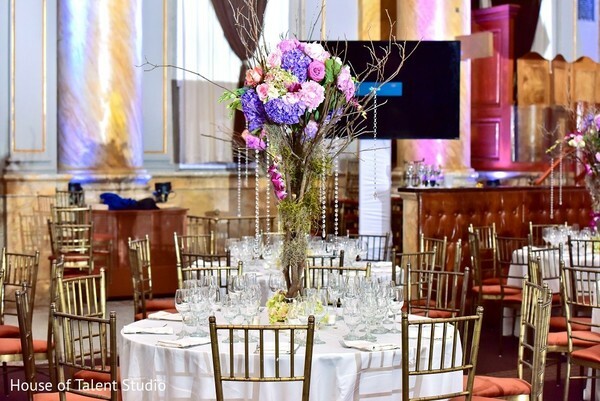 I first started with the themes or color palettes I wanted for each function: for example, the ring ceremony was an elegant affair, with draping around the entire room for an intimate, romantic feel. My outfit was a dark navy color with antique bronze work throughout. We added small personalization affects to each function, and for the ring ceremony we chose an all white and blue candy bar plus well-needed hangover kits for our lovely guests. 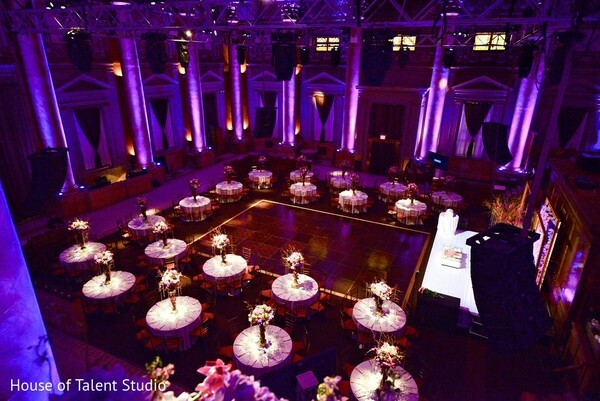 Again, we kept it very simple and focused on keeping our guests happy!" Stick around to see the happy couple strike a post for the camera in their reception portraits!